How you take your coursework is up to you. Our new PDF format for home study is now available on select courses. Look for the icon at the end of the course title. Not sure which to choose? PacePDH.com is approved by the American Institute of Architects (AIA Provider # J607) to provide online continuing education courses to architects. Since 2003 PacePDH.com has delivered over 400,000 online continuing education hours to more than 20,000 AEC professionals nationwide. All Ohio registered architects are required to earn 12 Structured HSW Continuing Education hours per calendar year (24 hours each 2-year renewal cycle) in order to renew their license. All of the hours must be in the areas of health, safety, and welfare (HSW). 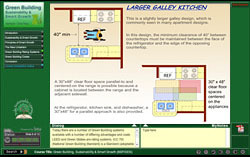 Structured hours are defined as educational activities in which at least 75% of the content and instructional time is devoted to HSW subjects related to the practice of architecture and provided by qualified individuals or organizations, whether delivered by direct content or distance learning methods (e.g., online courses.) Architectural Record articles are accepted, as are other online courses with AIA HSW credit. Note: All of the courses listed below have been approved by the AIA for HSW credit. Providers do not report completed CE hours to the Board, however, upon successful completion of each course you will be awarded a continuing education certificate. An architect shall complete and submit forms as required by the board certifying that the architect has completed the required continuing education hours. Forms may be audited by the board for verification of compliance with these requirements. Documentation of reported continuing education hours shall be maintained by the architect for six years from the date of the award. Purchase 10 or more hours and receive 40% off. Use Code "OHAV40". How you take your coursework is up to you. icon in front of the course title. Online timed audio-visual course with testing at check points throughout the course and/or at the end. Non-timed, read-only PDF document with online testing at the end. These courses are intended for all architects looking to complete continuing education credit requirements from the Ohio Architects Board. Approved by the The American Institute of Architects (AIA), Pace offers quality continuing education courses that satisfy the requirements for health, safety, and welfare (HSW) structured hours. As an architect, we know how valuable your time is and our goal is to provide you with effective and efficient CE courses that contain the latest and most informational content. Our courses for Ohio Architects is presented in a way that is entertaining while being educational. Pace not only offers the best in CE classes, but also helps make the process easy. You will receive a certificate of completion after each course that can be submitted directly to the Board. In an effort to keep our coursework current and engaging, Pace is always looking for course writers. If you can share your expertise and knowledge with others, or know of a respected author/presenter you can refer, please contact us today to get started.